The classic example of that is the Battle of Cannae, where 80,000 Roman infantry were surrounded by 40,000 Carthaginian infantry. Every description of the battle that I've seen talks in detail about how the Romans came to be encircled, but gives a hand-waving argument for why that was bad for them. Wikipedia and other sources say that the Romans turned around and fought in a circle (It's not like individual Roman soldiers were being attacked from their unprotected sides or back). Another "disadvantage" that's cited is that they were packed too tight, and didn't have room to wield their weapons. Presumably, they are saying that the Romans interlocked their shields. But couldn't they rotate their shields to create the necessary gaps between them? Ancient battles are often described as a shield wall pushing against another shield wall. Since the Roman wall had a higher density of soldiers, wouldn't that let them push better, giving them the ability to dictate the position of said wall, expanding the circle? Are there any examples of ancient battles where encirclement did not mean defeat, that is, the encircled side broke out and went on to win the battle? While the tactical factor (not being able to move units around) is important, the main issue is one of soldiers panicking. Remember that it does not matter what the numbers are actually; your soldiers cannot see the lines in the map and are victims of the fog of war. Soldiers in the battlefield do not get to see a nice map showing the position of the units, how thin the enemy lines are and how many of each side are still fighting. Specifically in the classic massed infantry fights, all that they can see is lots of people around them; particularly you do not see how many lines of enemies are before you even if you are in the front line of your army. Now, you are doing your part, advancing forward, with your back and your sides protected by your fellow soldiers, so you can concentrate on using your weapon and shield in the front. Life is good. Suddenly you hear a commotion at your back. The soldiers behind you move forward, pressing against you. You do not know exactly what is happening, but it is something very worrisome. Then word spreads that the enemy is attacking at your back. You do not know exactly what is happening. Maybe you are not completely encircled and there are still gaps left for you to flee. You know that if the other soldiers try to flee and you stay put you will be slaughtered, because nobody will be defending your back. But maybe – just maybe – if you start fleeing right now you will get an opportunity to make it home. And you fear that all the soldiers around your are thinking the same; maybe the rout has already started and you are just missing your opportunity. If you are in front of the enemy, you do not want to be the one holding the line while everybody behind you is fleeing, leaving you undefended. You move back. If the soldier behind you does not move, you push with your back, until he leaves you a space to retreat to or everyone is so tightly packed that you cannot move. So, at some time, the soldiers panic, they stop trying to fight and only think about fleeing, about finding a gap that the enemy still has not closed; the army just stops being an army and the rout happens. You do not ever need the army to be surrounded, routs happen all the time when the soldiers of one side figured (rightly or not) that they were going to lose. Typically, most of the casualties of the battle would happen as the rout developed. While the total encirclement might be the most impressive thing about Cannae, remember that it's just a special case of a pincer movement where the pincer goes all the way around the enemy. A pincer is itself just a special case of a flanking manuever in which both flanks are attacked simultaneously. The most important thing about Cannae was that Hannibal was able to flank the Romans; being able to then cut off their retreat thanks to his cavalry quickly driving off the Romans was just the cherry on the top. Flanking maneuvers were devastating to ancient (and modern) military forces. As you argue, it sounds like a flanked force should be able to reorganize itself, set up a shield wall or otherwise split itself up to take on an enemy attack from two sides. However, human beings can't fight effectively in two directions at once, and the goal of flanking is to force at least one soldier to do this, defeat them, and then move on to the next one. Flanking could also be extremely demoralizing: as long as your enemy was in front of you and allies to your sides, you knew that a path to retreat was open. If enemies began appearing on your side, it may only be a matter of time before they cut you off from retreat entirely. Being flanked was a major worry for ancient militaries, especially after it became clear that this was a major vulnerability for military units that were designed to move forward, such as a phalanx. Military formations were subsequently designed specifically to avoid flanks, such as by placing the strongest troops in the flank positions. Wikipedia and other sources say that the Romans turned around and fought in a circle (It's not like individual Roman soldiers were attacked from their unprotected sides or back). I believe they were in a half circle, not a full circle -- which means that the Roman line ended somewhere, which is where they could be flanked. If you look closely at the image you linked, you can see that most of the soldiers are depicted lined up fighting the Carthaginians -- the flanking is being carried out solely by the African Infantry and the Spanish and Gaulish cavalry, who are maneuvering past the Roman lines and attacking them from behind. Actually, I think they are literally saying that the Romans couldn't move their arms: I've always imagined the African infantry as pushing inwards into the core of Roman soldiers, causing the Romans to push inwards and back away from the Carthaginians and into other Romans. I can imagine that this would lead to severe overcrowding, where even non-panicking soldiers who knew where they should go and what they should do, couldn't, even as their compatriots died around them. Not if the enemy can get around your wall. At this point in the battle, the Romans had very little maneuverability: they could push forward or to the sides or they could try to run out the back. The Carthaginians, on the other hand, had all the maneuverability: Hannibal could reorganize any forces not actively fighting Romans at his leisure, which is why he placed the cavalry behind the Romans to cut off their retreat. Caesar did it, because of course he did. But he was fighting from behind fortifications on (every) side, not in an open field like Cannae. A more apt example might be Pompey's cavalry at Pharsalas: they maneuvered around Caesar's soldiers and tried to flank them, but Caesar anticipated this and had a line of infantry waiting for them, because of course he did. tl; dr - encirclement creates a mobility advantage for the encircling forces. Ultimately encirclement permits the encircling commander to choose the location, time, conditions, and duration. The defending/encircled force has no options. Melee formations are tightly packed - shields overlap. If you want to survive, you want to be as close as possible to the guy on your left and on your right. They are keeping you alive. The opponents will take advantage of every inch of space between you. You have just enough room to thrust your sword (or spear) forward and back. You and your squad have trained for hundreds of hours to be able to walk forward without losing that tight cohesion - without leaving a gap large enough for an enemy sword to get through. Good squads can move forward and sideways. Excellent squads may be able to execute on the diagonal, but remember if your foot moves to the left or right you're stepping in front of a squadmate. You can see forward. Your helm obscures your vision to left and right. Behind you is a mystery. You cannot turn your body and you can only turn your head slightly. In summary, a melee formation is an armored weapon that points forward, moves forward, attacks forward and is defenseless to the rear. If you enemy can flank you, he can carve you to pieces - if you turn your shield from the front to the side, the front will kill you. If you don't, the side will kill you. There is no option to turn to the rear; people behind you can kill you at no risk to themselves. OP suggests that the formation could form a square. (Aside: Someone challenged me on the point that OP suggests they form a circle; simple geometry tells us that the circumference of the circle expands with the radius; the shields stay the same size; circle is a suicide formation; what you want and what the video linked to below shows is square.) Squares are not mobile. An excellent squad might be able to march in square, but the encircling forces will always have greater mobility. The force with the greater mobility gets to choose where and when to concentrate forces; the encircled force has no options. Somewhere in that square is the weakest link and the encircling forces can attack it mercilessly; the defending (less mobile) forces cannot adapt. The defender must accept that the attack will occur on the weakest possible location and relentlessly. Attackers can use their strongest, freshest forces against the defenders weakest, wounded, tired, forces. Once you're encircled, there is no chance to win, and you know it. The only option is to break out. If you can't break out, you will die when and where your opponent chooses. At the request of several that I provide sources, I spent 15s searching youtube for video of pre-modern formation melee fighting. The narrator notes the requirement for coordination and teamwork. This is a very loose shield wall. Example - note that if the formation were encircled, the officer helping them to navigate and move would be inside the wall and blind (or dead). Participants in the turtle formation are effectively blind. It is very difficult to coordinate the activities within the turtle. If you stop to chat about which way you're going to move, you'll die. What they are doing is very difficult; they do have an officer shouting commands. They don't have people hammering weapons on those shields constantly. THey're walking on a flat field with effectively no obstacles. Imagine how that formation adapts to dead bodies, discarded weapons, mud, etc. Any time the formation slips, the encircling opponent will slip a weapon inside the resulting flaw. Aside: OP asks why encirclement is bad; OP did not ask for an analysis of how Roman forces at Cannae came to be encircled (that is a valid, but distinct question). I'm answering only the question that OP asked. Aside: I'm also relying on my personal experience in fighting multiple opponents - something I do regularly. Mobility is key. It doesn't work the way it does in the movies where the stuntmen stand in a ring (which is conveniently just on the edge of the camera frame so you can't see how inept they are) and wave their weapons vigorously but politely take turns in attacking the protagonist. The moment the combat starts, the defender needs to be in constant motion; the key to success is to move in such a way that the attackers are hampered by their partners. The specifics don't translate to formation fighting, but the principle of greater mobility = greater probability of survival = does translate. I just wanted to expand on a comment by armatita and hence address some part of the OP's question more generally. Independent of the specifics of this battle and tactics, it is mathematically disadvantageous to be encircled, even partially. If we assume that each person needs the same amount of space to actively participate in combat (move their weapons effectively, which is usually not an unreasonable assumption), then the outer concave will usually have an advantage in the number of active combat participants. 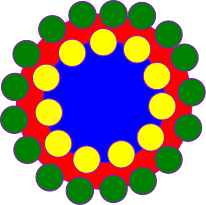 This can lead to a fast loss ratio for the inner circle and significantly smaller forces can best larger ones. While at first one may be tempted to say that they are fighting on the same curve and should have the same curve length to space out on, the reality is that there is some space between the opposing forces, so the illustration is as shown above (See figure 1) with the curves they stand on shown by the edges of the blue and red circles. The yellow and green circles are the same size, representing the space needed for an active combatant to fight effectively. In this example at any time in this fight is 17 vs. 11. That will make the yellow combatants die at a faster rate, and depending on what that rate turns out to be it can happen that green wins even if outnumbered significantly. In fact, in the above we could fit 8 more active fighters inside the blue circle (see figure 2), but even though they are 19 vs. only 17, they are being force to fight as 11 vs. 17. These ratios skew further as the core is packed closer than the space of an active combatant. Suppose that the area needed by an active combatant has a radius of is 0.75 meters. 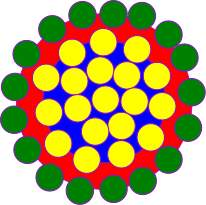 Mathematically, each circumference is 2*Pi*r, here we have r1 and r2, which differ by, suppose 1.5 meters (measured from underneath the center or one soldier to underneath the center of an opposing soldier). (r1-r2)*2*Pi/1.5 gives the number of extra soldiers fighting actively in the surrounding force. So the outside force always has 6 extra fighters. This does not depend on the size of the circle, but on the curvature of the concave. 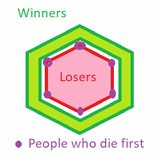 So being surrounded in a circle isn't such a huge disadvantage for large numbers of combatants with large circles, 17 vs. 11 is bad, but 10,000 vs. 10,006 at a given time should be tolerable, that is, it shouldn't give so much higher of a death rate that is is the determining factor when your total numbers are 80000 to 40000. Or even 86000 against 50000 as another answerer suggests. So, what can we conclude here? Having a concave is always an advantage, but with large circles (which have low curvature) it is not much of one. There are also advantages to being surrounded, such as interior lines as another answerer pointed out, but I think those occur at somewhat larger spacing. So what actually happened in this battle? I think others have given very good answers that cover this already. I would just also point out that the edges of a forward facing formation are particularly susceptible to high curvature flanking, giving the flankers a significantly greater advantage than the above circular scenario. You are correct that being surrounded isn't necessarily a bad thing, and this question isn't a straightforward one to answer. As Pieter Geerkens noted in a comment, if you do it right then the defender enjoys the advantage of interior lines, and smart commanders throughout history have let themselves be surrounded on purpose to that effect. To arbitrarily pick an example, this is what the Chinese did during the Battle of Xuzhou (note: Chinese Wikipedia; English does not have this info), where forward elements were pulled back, putting the HQ within the Japanese shelling range, but also allowing the Chinese to move reinforcements between the north and south fronts, and execute feints and flanks against the more mobile Japanese. While the front ranks were gradually advancing, the bulk of the Roman troops began to lose their cohesion, as they began crowding themselves into the growing gap. Soon they were compacted together so closely that they had little space to wield their weapons. Just as the Romans were on the brink of crushing the enemy center, the Carthaginian flanks were brought to bear and the pressure pinned in the Roman advance. Hasdrubals' cavalry completed the circle by forcing the rear of the Roman line to turn back and form a square. All around, the massive bulk of the Roman army was forced into confined space. Hannibal brought his archers and slingers to bear and the result in the confines was devastating. Unable to continue the original break through against the Celts in the center of Hannibal's lines, the Romans were easy prey for the Carthaginians. Hannibal, with complete fury, encouraged his own men, under fear of the lash, if they weren't zealous enough in the slaughter. There's sampling bias. Encirclement doesn't always lead to defeat, but when it does there's no possibility of a retreat, magnifying the outcome of the battle. It's not a perfect circle. The line of battle is uneven, and the roughly circular shape makes it more likely for single defenders to be exposed. If we look at the silly diagram below, you'll notice that the encircled party has 6 edges. If you stand at any of these edges, your lifespan is decreased significantly because you now face multiple enemies. For a force with clearly superior equipment and training fighting a numerically superior force, forming a circle can actually be desirable, because it does limit exposure of individual soldiers. I think there may be a bit of confusion here between "encirclement" and "envelopment" - or a pincer movement. Think of an encirclement being a possible outcome of a double envelopment, with a single envelopment being the flanking of one wing of an enemy army. It is also not clear that the result of encirclement caused Roman soldiers to panic and attempt to run away; rather they were packed like sardines. Cannae did not begin as an encirclement, but rather as a double envelopment. The Battle of Tannenberg in WW1 is a similar, modern example. At Cannae, the Romans attacked the Carthaginian center. In Robert L. O'Connell's "The Ghosts of Cannae" he explains that it was actually the Romans' offensive strategy to attack in column and penetrate the Carthaginian line - so they may not have exactly needed luring, but it could be argued that they were given a false impression of early success by their forward movement after contact with the enemy. O'Connell writes "Geometrically this called for a narrow, thick formation", and Polybius describes the Roman formation "placing the maniples closer together than was formerly the usage and making the depth of each many times exceed its front". O'Connell again writes "Long, narrow columns are easier to keep together, and, they therefore move faster and more cohesively on the battlefield. The many lines to the rear also insured an almost inexhaustible supply of fresh fighters to take the place of the fallen and exhausted, a kind of conveyor belt of shark's teeth". He goes on to argue that many of the Romans present were inexperienced, and so close a formation would have allowed them to feel more confident and protected. So the Romans deployed with the intent to go forward, and planned for a potentially long fight - but did not count on the enemy actually acting against them on their flanks. I had written that the details of the fight in the center were disputed - O'Connell notes that Hannibal seems to have deployed his Libyan infantry in column on the flanks, with the Gauls and Iberians fighting in the center (they would have the responsibility of executing a fighting retreat to pull the Romans in). He has us envisage this as a backwards letter C (or like this "I^I" if viewed from behind the Carthaginian lines, with the "^" turning the other way and moving backward as the battle went on). So it is really the case that the Libyans remained in place until the Romans advanced far enough to double envelop themselves, at which point the ends of the Libyan columns moved forward and sealed the Romans in while the center stopped. So the Romans mostly trapped themselves, although the Gauls and Iberians did advance at first, in a crescent shape. However - and this is what I remember as being a bit of historical guesswork - Polybius claims that the Gauls and Iberians really were forced to retreat for real, and it was not an executed maneuver. But whatever the case, the meat of the Carthaginian casualties were Gallic. The "core" of Hannibals' army was North African and Iberian, so I have read into this as Hannibal having little problem with allowing the Gauls to do the majority of the dying (and the Gauls may have been happy to do it so long as they got to kill some Romans). So, the Romans pushed the Carthaginian center inward and the Gauls/Iberians collapsed and began to retreat, whether intentional or not. As the Carthaginian center moved back, the Romans were given the impression that they were succeeding - in reality, they were ensuring that the enemy could flank them on both sides. Then, the Carthaginian center, which had appeared in retreat, refused to budge (this may have been because [I had said veteran, this would actually be the position occupied by the North African light infantry after they had skirmished) light infantry had remained at the stopping point, and blocked the retreat of the Carthaginian center which had been in contact with the Romans, to prevent an actual rout being caused by panicked soldiers running through their ranks [I can't source this, so take it with a grain of salt, but I remember reading an account concerning the stopping of the Gallic/Iberian retreat]. As the battle progressed, the Romans were attacked from behind by cavalry, and the Carthaginian wings attacked forward, turning the pincer into a full circle. O'Connell notes that it may have been the case that the rear of the Roman formation was no longer occupied by the Triarii, who could have dealt with cavalry charges, but by the lightly armed Velites (skirmishers) who had retreated behind the Roman lines. On a macro scale, being enveloped on both sides means that there is no front line for you, as the victim. If you move forward toward the enemy center, both your friendly flanks encounter enemies adjacent to them as well as in front. To a general, this also means your flanks are being threatened - those enemy soldiers adjacent to your men are at risk of actually moving behind them. In reality a full encirclement is risky for the attackers as well, because enemy reserves or a cavalry force could attack your thin/exposed encircling force. Now the vital thing to note about Cannae in particular, or any ancient battle, is that men need room to swing a sword and deploy a shield. If you put your arms out in a T-pose, this is about what Roman doctrine declared necessary for a soldier to function. While the double envelopment was bad enough, the Carthaginian wings were able to fold in behind them and fully encircle them. As the Carthaginian wings folded in and encircled the Romans, the Romans were pressed in against one another. The men at the edge of the encircled force do not have room to properly defend themselves or attack. The men behind them on the inside of that encircled force are also squished, and as you go further back may be unable to even see the enemy at all until it is nearly their turn. Importantly at Cannae, the Carthaginian cavalry defeated the Roman cavalry first - this was key in ensuring the Carthaginians could safely execute their maneuver. The victorious Carthaginian cavalry actually turned and attacked the Roman rear, causing the Romans to form up more solidly and drive further into the Carthaginian center. Although the Romans had deployed a gargantuan force [Livy states it was only 10,000 men overstrength, Polybius claims it was the size of eight legions rather than the usual four, or about 90,000 men. If the force were Livy's, the Roman Army at Cannae would have deployed at a strength of at least four legions, maybe five, at around 40-50 thousand], they had lost the initiative and were forced to blindly react as events unfolded. Their numbers advantage was lost because the Carthaginians limited their frontage as they enveloped them, and their advantage as heavily armed and armoured infantry was also negated by being compressed into such a small area. It took the Carthaginians the entire afternoon to destroy the encircled Romans. In some sense this is the trouble with encirclement - the enemy can't run away, and is forced to fight to the death. Traditionally this is a bad idea, because you want the enemy to rout - many ancient and medieval battles saw the most casualties occur during pursuit of a retreating army - light cavalry was especially adept at this kind of pursuit. But it should also be noted that about 10,000 Romans actually fought their way out of the encirclement at Cannae and escaped. Even a full encirclement and near-annihilation is not a guarantee that everyone is going to be trapped, although it's still a military victory. In the modern day you can see this in Mosul, as the original plan called for a "horseshoe" deployment around the city, which would have allowed ISIS fighters to retreat and be attacked in the open. But what ended up happening was a full encirclement of the city, and so you have a pitched battle to the death. In some sense, an encirclement is not unique - it is a common enough goal to force the enemy to retreat into a hidden blocking force, which annihilates the retreating enemy, or keeping a cavalry reserve to ride them down. The big difference is that the event is localized to the encircled area. Or, as at Lake Trasimene or Marathon, terrain is used to block the enemy retreat (a lake and the sea respectively). So what you see more commonly is in fact the threatening of flanks - single envelopment, or double envelopment, and perhaps a pursuit of a routing army. Instances of entire armies being surrounded are more rare, but the threat of being surrounded is much more common. I mentioned Tannenberg because the Germans executed a similar maneuver, allowing the Russians to make progress against their center. The Russian general, Samsonov, had initially thought that his being with the main body of his army would allow better situational awareness, but as the battle progressed and he realized what was happening, it was clear to him that he had been mistaken. While being in the rear may have had its own drawbacks, being with the main body meant he was too close to see the bigger picture until it was too late. The Russian army was surrounded and nearly completely destroyed - actually an anomaly for the era, but presaging the German concept of encirclement warfare that would be used in WW2 and augmented by the use of tanks to poke holes in the enemy line, allowing follow-on troops to roll up the flanks of an enemy, create a ring behind the enemy line, and compress the pocket. Note that in a modern encirclement, the area covered thanks to the range of weapons is much larger, and men are not being packed like sardines. Of course in reality, full encirclements were tougher to execute than was imagined. During the invasion of Russia in WW2, the Germans found that the creation and compression of pockets created a pattern where their armour was far ahead and exposed, while the main infantry force was engaged in brutally attacking the encircled Russian forces. Then the infantry had to be force-marched to catch up with the tanks, who had to remain idle until the infantry could get to them and relieve them, allowing them to re-deploy. Even when things went well, the encircled pockets were often "leaky", allowing thousands of enemy soldiers to escape at night or through gaps, albeit without much of their equipment. David Glantz actually theorizes that this encirclement tactic, though successful in one sense, cost the Germans the war in Russia. German armour in Army Group Center was so far ahead of the main infantry force during the approach on Smolensk that they were subject to a huge number of Russian attacks which they had to defend against alone (the infantry were behind them, compressing the pockets they had created, and then trying to force-march to them). Because of this, the German armoured divisions had to deploy along much too thin a frontage, even forcing their engineers and other support units to hold a portion of the front line, and were attacked from multiple directions sometimes simultaneously over an extended period. Because the infantry working with the tanks were not as numerous or as heavily equipped as the regular army units, and because tanks are not especially adept at defensive fighting, Glantz thinks that these spearpoint units took an inordinate number of casualties early on in the operation from which they never fully recovered. They had been blunted, by dint of their own success outrunning their follow-on infantry. "In practice, however, earlier campaigns also demonstrated that some enemy forces could escape from these encirclements if the follow-on German infantry failed to advance quickly enough to keep up with the panzers [armour] and seal the encirclement. This frequently occurred because the German Army never had enough motor vehicles to equip more than a small portion of its infantry troops. Instead, the vast majority of the German Army throughout the Second World War consisted of foot-mobile infantry and horse-drawn artillery and supplies, which often forced the Army's panzer and motorized spearheads to pause while their supporting units caught up by forced marches". "...this study argues that the battle for Smolensk was much larger-scale than previously believed, it damaged Army Group Center far more than previously thought, and, ultimately, it contributed significantly to the army group's embarrassing defeat at the gates of Moscow in early December 1941." "As a result, the spearhead of Hoth's panzer group...had no choice but to defend the 'eastern front' east and northeast of Smolensk and also man the northern half of the inner encirclement line containing and compressing Soviet forces within the Smolensk pocket. ...eight motorized battalions of XXXIX Motorized Corps' 12th Panzer and 20th Motorized Divisions had to occupy and defend the almost 80-kilometer-wide northern face of the pocket, with, at best, an average battalion frontage of about 10 kilometers per battalion, from 17 through 24 July. Likewise, the 10 motorized infantry battalions of 18th Motorized and 20th and 7th Panzer Divisions had to defend the 100-kilometer-wide front east and northeast of Smolensk against the assembling forces of four Soviet armies. Although all of these mobile divisions tried to economize forces by assigning their reconnaissance (motorcycle), engineer, and other combat support battalions their own defensive sectors, their battalion frontages were far too wide to be effective either in defense or in the attack. This, in turn, also caused inordinate casualties among the motorized infantry, which only exacerbated the problem of excessive frontages." Encirclement means that you cannot retreat. The enemy can evade your blows but you cannot evade theirs. Given how tightly packed ancient formations were this simple mobility limitation meant death for anyone encircled or somehow constrained by disadvantageous terrain. Soldiers arranged in a circle will need to step backwards when casualties occur, in order to maintain a cohesive circle without gaps.Those encircling will then push forward. Soldiers were generally trained and experienced in pushing forward against the enemy lines. The idea was to break the enemies shield wall formation to provide you with an advantage. Walking backwards was unfamiliar, and could lead to soldiers falling over, walking into those behind them, or simply being pushed over by the advancing enemy, who has many rows of men pushing forward. You can try this at home. Find someone as strong as you, and each try to push each other past a line. Now, have them instead try to push you backwards, and you try to be pushed backwards at a very slow rate. Most likely, you will fall over, or be pushed back much faster than you wanted to be. Now imagine there were an assortment of sharp weapons, friends, and corpses behind you. This reminds me the battle of Alesia, in 52 BC where Romans set siege to the city to find themselves to be under siege. So I think at the end of the day it depends of the situation and on the commander office skills. It is not a sure thing that surrounded forces are doomed. As a non-historic answer, I've participated in a number of large (around 2000 participants) live-action roleplaying battles. In all of them, encirclement was a sure sign of imminent defeat. 1.) Encirclement very often was a symptom, not a cause of defeat. By the time one side got encircled, the battle was clearly lost already. 2.) An encircled army has no strategic options or maneuvers left. All that's left is to fight to the end. This speeds up the defeat compared to the same battle in battle lines. It's not even that more people get under attack, it's also that very fast after encirclement, everyone is packed in tight and there's not much room left to, for example, move reinforcements to a failing side. LARP battles do not share all of the strategy and context of roman battles, especially the excellent training and discipline the roman army was known for, but in this particular case the experience seems fitting to me. I would not say "in ancient battles, being encircled meant defeat". Because that's not true. I would say, "in all battles, being encircled means defeat, unless you have good leadership which is prepared. 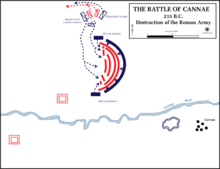 Thus not so much in "ancient battles" does encirclement means defeat, just in the Battle of Cannae(216 BC). Encirclement alone wasn't the deciding factor in the Battle of Cannae. It's not like the Romans thew down their arms and surrendered after they were encircled. Encirclement is cited because it was seen as an achievement by a master tactician in general Hannibal of Carthage. Taking 40,000 and encircle the much larger 80,000 Roman army. It is why even to this day we consider Hannibal one of the greatest military tacticians ever. Hannibal did this because he believed the well disciplined Roman legions were both vulnerable to their rear and would panic if encircled. The Romans at Cannae used specific formations to wage war and those formations did not operate well with enemies in their rear. Which wasn't a problem because nobody could image a commander being able to encircle 80,000 Romans. 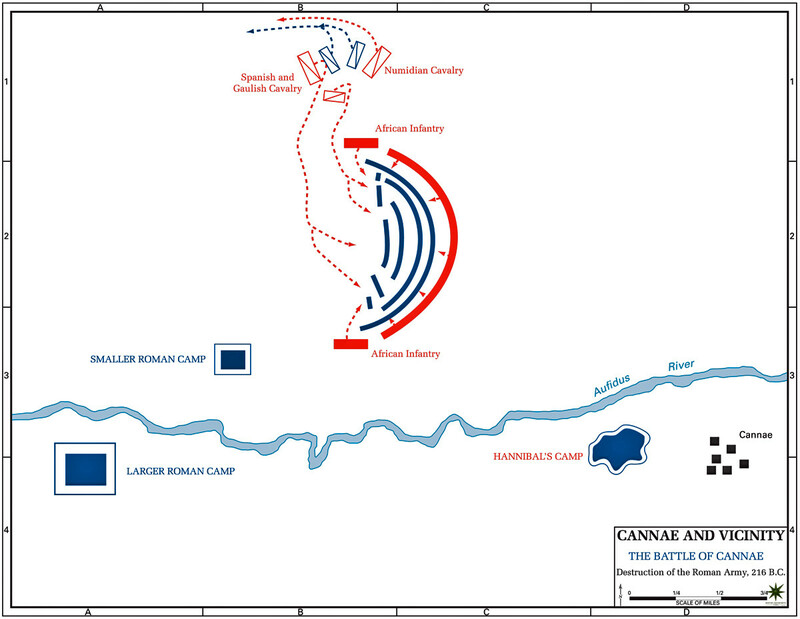 The subsequent slaughter enabled by Hannibal's tactics both proved Hannibal right, and decided the battle. Contrast this with the Roman battle of Alesia (52 BC). The Romans under Julius Cesar laid siege to the Gallic fortress of Alesia. Alesia's allies arrived and surrounded the Romans who were still surrounding Alesia. (think of a giant donut) Cesar planned for this and had built fortifications in an outer ring to his fortifications besieging Alesia. At one point the Romans were outnumbered by 4 to 1 and surrounded. Yet in the end the Romans won, because they had the superior leader, and had planned well. Not the answer you're looking for? Browse other questions tagged military ancient-history ancient-rome carthage punic-wars or ask your own question. How did melee soldiers in the front rank of a formation fight without getting tired? What do they do with corpses after a battle? Were mounted soldiers really an advancement during the Middle Ages?